Construction on the Columban seminary in Bellevue, Nebraska proceeded throughout late 1921 and the first half of 1922, under the direction of Columban Father Edward J. McCarthy. 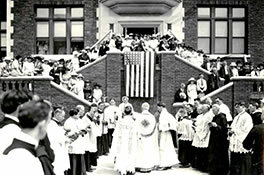 An illustrious dedication ceremony took place on June 29, 1922, led by Archbishop Jeremiah J. Harty of Omaha, and included dozens of Catholic clergy, nuns, and other religious, along with many other dignitaries. Incidentally, the date of the seminary’s dedication was four years to the day after the establishment of the Society. Classes began at the Bellevue seminary on September 1, 1922. The Columban Fathers had set the stage for a new wave of missionaries trained in the U.S., as well as a lasting presence in Bellevue.